"J.D.P. Co." - Left Pin. 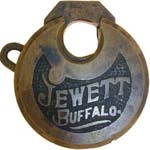 Made for: John Deere Plow Co. (99.5). "J.D.P. 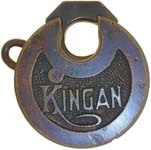 Co." - Left Pin - High Shackle. Made for: John Deere Plow Co. (99.6). "J H W" - No Pins. Mfg by: Possibly John H. Wilkins. (102.0). "J.W.M 6•LEVER" - No Pins. "J. Walter Miller". Mfg by: J. Walter Miller Lock Co. (103.0). "K•C•S•RY•" - 2 Pins. Made for: Kansas City Southern. Mfg by: Miller Lock Co. (104.0). 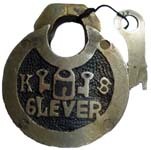 "KEYSTONE 6-LEVER" - No Pins. Mfg by: E. T. Fraim Lock Co. (Keystone Lock Works). "E.T.FRAIM MFG. LANCASTER PA. U.S.A." is stamped on the obverse of the shackle. (105.0). "KEYSTONE 6-LEVER" - No Pins - "PORT ARTHUR ROUTE". "Port Arthur Route" is the nickname for "Kansas City, Pittsburgh and Gulf.". The obverse is the same as #205. 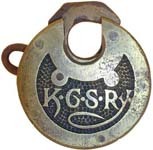 Mfg by: E. T. Fraim Lock Co. (Keystone Lock Works). (106.0). 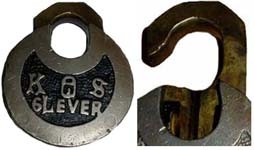 "KING 6 LEVER" - No Pins - High Shackle. Bronze. Mfg by: Miller Lock Co. (107.1). 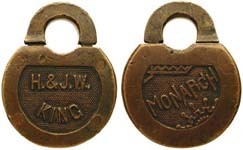 "H. & J. W. KING" - "MONARCH" - No Pins. 2 1/2" wide x 3/4" deep. 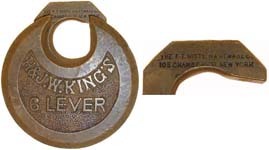 Made for: H. & J. W. King Hardware Co. (107.4). "KO-OP 6LEVER" - No Pins. (108.7). "K S" - No Pins. 2.200" diameter x .600" deep. The keyway is at 4 o'clock. Grooved shackle guide. Nickel plate finish. This lock was found in northern India. I believe this lock is related to #2242 & #2537. Mfg by: Foreign Manufacturer. (108.2). "K S" - No Pins. 2.500" diameter x .600" deep. The keyway is at 3 o'clock. Grooved shackle guide. Nickel plate finish. This lock was found in northern India. I believe this lock is related to #2241 & #2537. Mfg by: Foreign Manufacturer. (108.3). "K S" - No Pins. 3" diameter. The keyway is at 3 o'clock. Grooved shackle guide. Nickel plate finish. This lock was found in northern India. I believe this lock is related to #2241 & #2242. Mfg by: Foreign Manufacturer. (108.4).